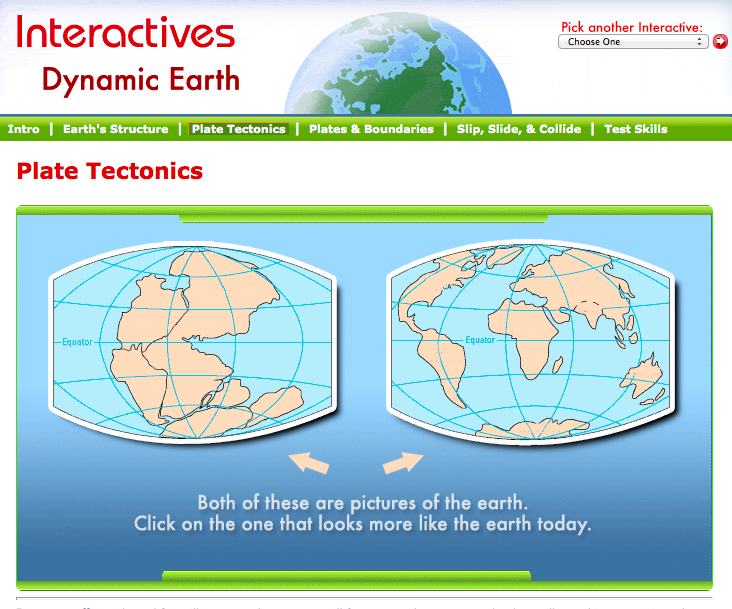 Check out this AMAZING resource you can use to further investigate plate tectonics! Today we talked about writing and graphing ratios. When two ratios are equal, they are called proportions. 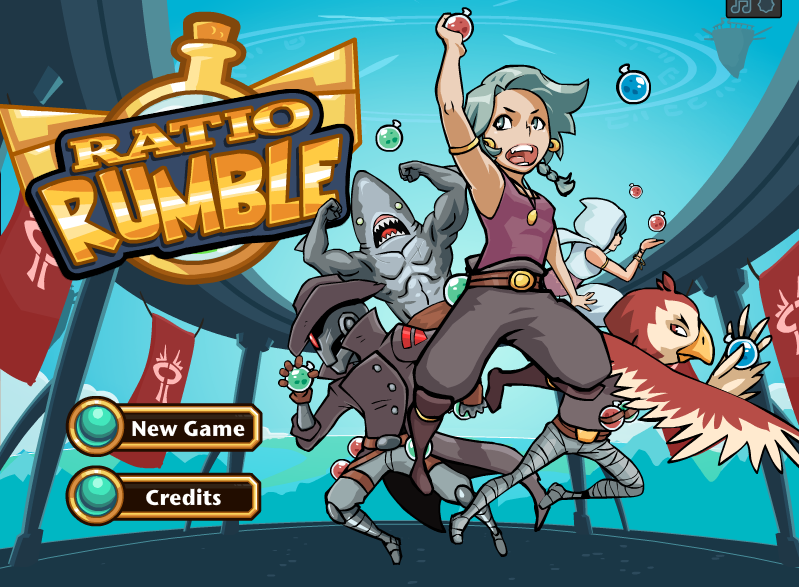 Check out the following Ratio Rumble game for some more ratio practice! I hope you are enjoying your long weekend! I'm also having fun planning some activities for the upcoming week. In math this week and will be taking a closer look at graphing ratios. Check out this great video from www.learnzillion.com that tells you how to do it. We will have plenty of practice in class to help you understand how to graph the ratios on a coordinate plane. You will also have homework Monday and Tuesday night to complete. On Thursday, you will have a quiz based on what we've practiced in class and on your homework. You may want to complete you Compass Learning assignment before you quiz, even though it is not due until Friday. The extra practice could really help you when preparing for the quiz. 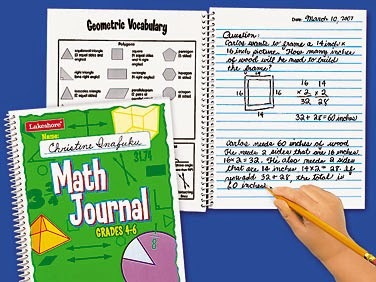 We've spent a lot of time last week talking about how to write a good math journal entry. Please use that knowledge as you complete your daily math journal assignments. Your journal will be due Thursday for me to check. In science, get ready to move and shake as we will be talking about plate tectonics! Check out the following visuals that will go with my lesson I will give on Monday. As we discuss plate tectonics over the next two weeks, please complete the following choice sheet to help guide your studies. You will also have a vocabulary quiz Friday, October 3rd and a final test on plate tectonics Friday, October 10. These will be your LAST grades in science for the first term, so please try your best. Here is a copy of your vocabulary words and a study guide to help you prepare of the test. Looking at our class calendar, you can see that we also have a dress down day this Friday. Just bring in $1.00 to participate. All of the proceeds will go towards the "Pink Out" Champagne for breast cancer research. Finally, first term parent/teacher conferences will be coming up in two weeks. If you haven't done so already, please click on the "Signup Genius" button located at the top-right corner of this page and choose a time to meet Ms. Carol and myself for a conference. Some Ellis 6th graders have some artwork on display at Zoe's Kitchen at 1821 East Victory Drive. The artwork has a food theme, so viewing it could make you hungry for some of the great Mediterranean food on the menu! Today we has some fun testing the pH levels of various liquids. We created a simple indicator by boiling red cabbage. When the strained juice was added to the liquids, it changed its color depending on the pH level. Acids were red/purple and bases were blue/yellow. The pH of a soil is important because it affects its fertility (the ability for plants to receive nutrients from it). Some students are choosing to create three-dimensional models that show the 6 soil horizons we've been studying. 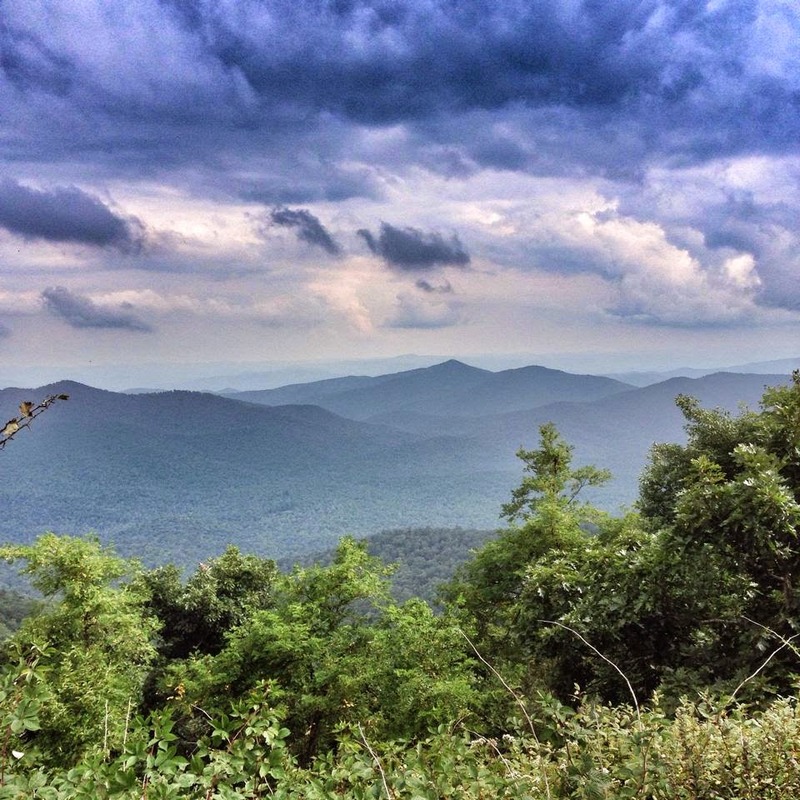 Each horizon has a characteristic unique to that particular layer. Please share your creations with your classmates when they are complete! It's going to be a short week at Ellis...we do not have school on Thursday or Friday. That being said, we have a mountain of items to take care of before you say good-bye for your long weekend. In math, we will be focusing on skills that will help us improve our math writing abilities. I will share some strategies you can use as you complete your weekly math journal assignment. Writing about your math work is important because it will enable you to think more critically about your work. In addition, it will improve your writing skills across all subjects. You will NOT have a Compass Learning requirement this week, but feel free to do some choice work on the program if you have an extra minute to spare. In science, we will be finishing up our focus on soil. We will be doing a fun lab on pH Monday. During the lab, you will be using a pH indicator created using boiled cabbage to test various liquids. Changes in a soil's pH can affect the fertility of the soil. If you have not done so already, please choose a time for your parent/teacher/student conference by visiting the Signup Genius page. It can be found by clicking on the button below. Today we talked about differences in soil found around the world. Take a look at some soils found closer to home with this awesome Soil Postcard interactive created by the Smithsonian Institute! 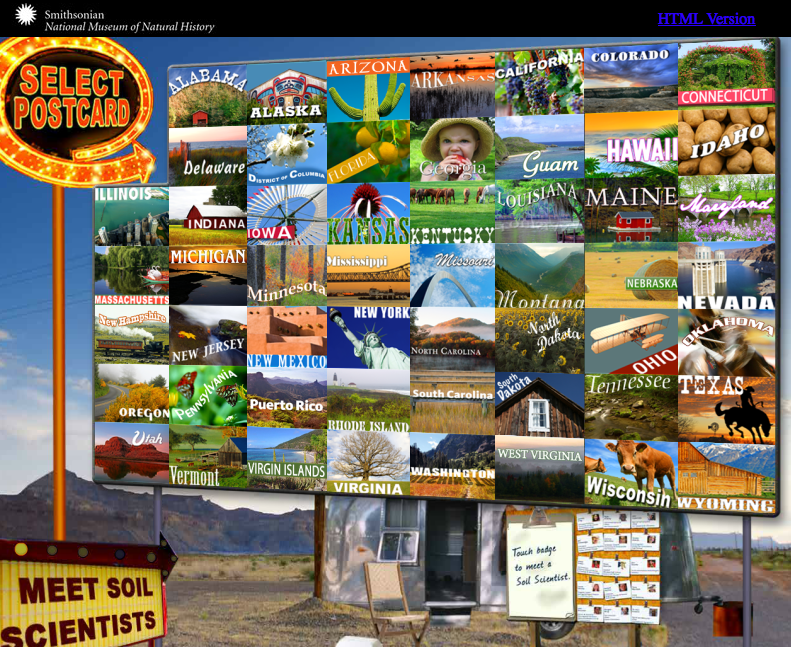 The site allows you to travel to each of the fifty states and investigate major soils found there. 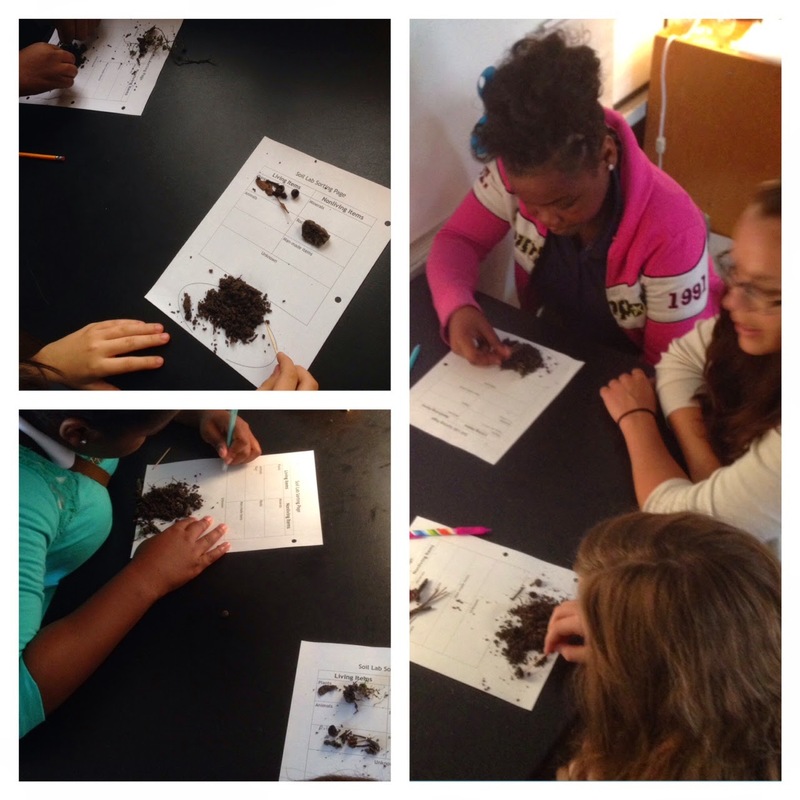 Today we dissected soil to discover what it is made of. We found many items including plant remains, sand, unidentified rocks, and even an earthworm or two! The objects in the soil were sorted into two groups: organic and inorganic. Our soil studies will continue over the next two weeks. 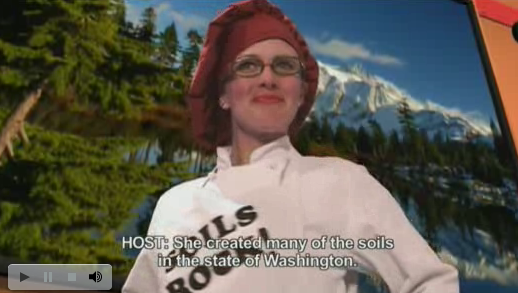 Just for fun, check out this hilarious video all about how soil is made! Can you believe that we are over half-way through the first term of school already? We only have 4 more weeks until the beginning of term 2! Time flies when you are having a good time! This week in math we will continue our work with division. We will turn our focus from decimals to fractions. You will have some division of fractions lessons, classwork, and homework to prepare you for a quiz Thursday. Your journal (due Thursday) and Compass Learning assignment (due Friday) will also give you some practice dividing fractions. Check out the following sheet for some instruction on the process and a little extra practice. The answers are found at the bottom of the page. In science we will spend the next two weeks getting our hands dirty studying soil! After some lessons on soil topics, you will be asked to complete the following choice sheet to guide your soil studies. Please note that it is due NEXT WEDNESDAY (because we do not have school next Thursday or Friday). You will have two tests during our work with soil. The first will be a vocabulary quiz Friday, September 19th. The next will be a soil test on Wednesday, September 24. Use the following two documents to help you prepare for the tests. 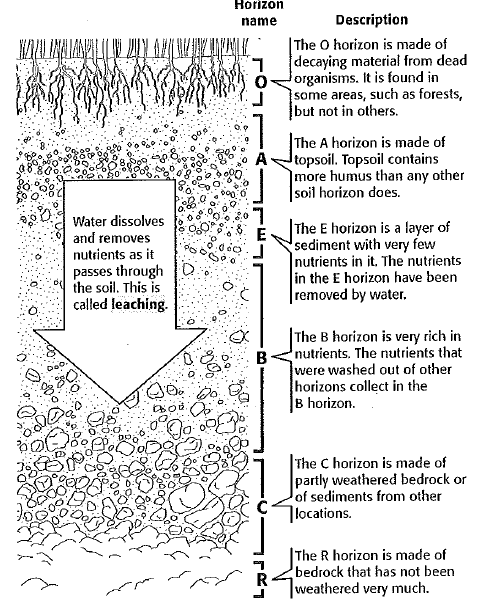 We will also spend some time studying soil horizons. 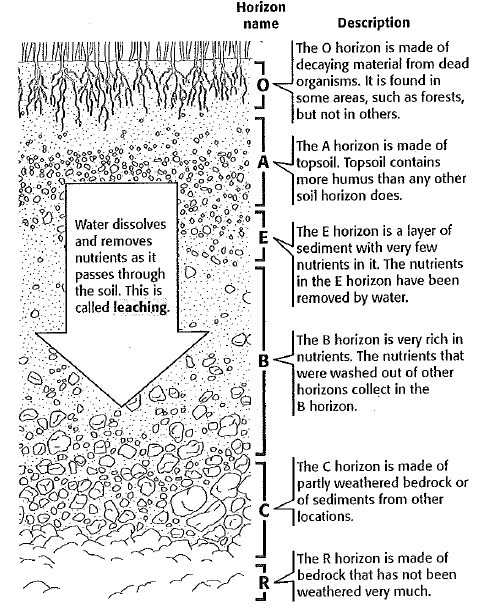 Here is a great diagram outlining the important parts of a column of soil. Progress reports will be sent home Tuesday. Please take it home, review it with your family, sign it, and return it to your homeroom teacher Wednesday. If you or your family have any questions, please note them on the report. You can also email me any questions or concerns at trent.kissinger@sccpss.com. It's going to be a busy, busy, busy week! Don't be so busy that you forget about the free dress down day on Friday! This and other important things to remember have been placed on the classroom calendar. You should also write them in your planner. Please see me if you need some help doing so. A special thank-you to the rangers at Skidaway State Park for sharing a wonderful presentation about the geological history of the area and showing us some awesome fossils, artifacts, and living animals! During our morning meeting, we discussed the the events of September 11, 2001. We had time to share our thoughts and feelings concerning terrorism. It also gave us a chance to pause and show empathy for all those who grieve. To end our discussion, we read the following poem "One Today" by Richard Blanco. During our discussion of igneous rock today, the topic of the eruption of Mt. Vesuvius was brought up. Here is a great video from the BBC about the eruption. Check it out! Are you ready for another great week at Charles Ellis?! I know I am! In math this week, we will be reviewing division. I know division is something that you have been doing for a few years now, but I really want to take a deep look at what it means to actually divide numbers. After a review of long division on Monday, we'll take it up a notch and throw some decimals in the dividend and divisors. Be sure to try your best on your classwork and homework this week because we will have a test on division Thursday. To help you with dividing decimals, you will need to complete a Compass Learning assignment this week as well as a math journal (due Thursday). 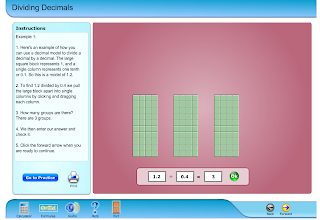 An interactive lesson about dividing decimals. In addition, check out this textbook chapter on dividing decimals. If you choose to use this for some extra practice, I can check your work for you, just place it in my box. Again, this isn't required, but it is a great tool to use if you feel you need more practice with the concept. Please study the following items for your test on Friday. You will also need to review your vocabulary words from last week. 1. Your three choices from your Hard Rock Cafe menu are due Friday. Be sure to put your name, date, and activity on each assignment before you staple it to your coversheet. 2. Our fieldtrip to Skidaway Island State Park will be Friday! We will be walking the trails and learning about fossils. Please wear comfortable shoes. You are more than welcome to purchase a school lunch to take along or to pack your own at home. Keep in mind that our fieldtrip will take up most of the day Friday, so you will not have a worktime to finish your assignments that day. If you have not done so already, please submit your Fieldtrip forms and money ($2.00) by tomorrow, Friday September 5th. Late forms and payment will not be accepted. Funds have been donated for anyone who is having trouble affording the trip. Please email me or send in a note if you would like to take advantage of this offer. I'm looking forward to a fun island adventure! There is so much to learn when studying rocks and the rock cycle! Luckily, there are a number of websites that can help you as you work. One of the best is the Interactive Rock Cycle site. 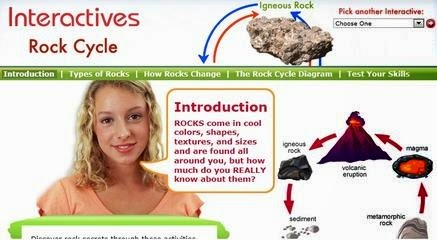 The page will take you through each type of rock, the rock cycle, and give you a quiz at the end to test your knowledge. Check it out by clicking on the picture below.